It’s not long now (less than 3 weeks) that me & my mate Paul start our 3000+ mile walk along the Continental Divide Trail! Before we go both of us are selling off various things that we don’t really need to raise a bit of cash for a lager or two en route. 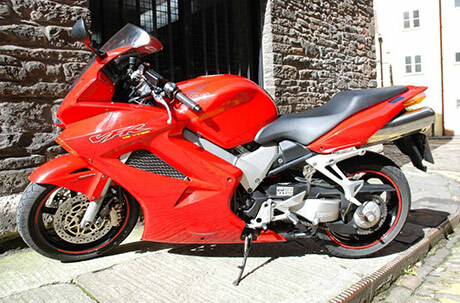 Paul’s got his pride of joy motorbike on ebay at the moment. I don’t know much about motorbikes, but this one looks bloody fast! Currently bid is £1200, Paul was hoping for a bit more, so get on there and grab yourself a bargain! Mar 31	This entry was posted in Stuff to Buy by cookie. Bookmark the permalink. Walking… 3000 miles?? I’ve done a lot hiking trips here in my home state of Colorado, but I’ve never even entertained the idea of traversing the whole state, let alone the entire continental divide. (!!) Nor have I heard of anyone doing this before. Hiking for 6 months is less a vacation, more of a spiritual quest. In fact I’m not sure Bilbo Baggins traveled that far to deposit the ring. I would recommend taking your motorcycle! Feel free to holler if you would like any Colorado info. Good luck with the walk man, it looks like it you should have an amazing time one way or the other on it!